Product Advancements Let Drivers Go Green Without a New Car. 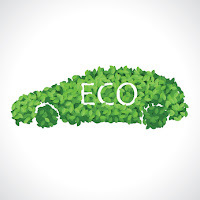 With gas prices soaring, environmental concerns and technological advancements in the auto and energy industry, ecological cars (eco cars) are slowly entering the mainstream market. Eco cars are vehicles that do not solely rely on fossil fuels for energy. The most popularly used energy source for eco cars is electricity. Fuel cells (usually lithium-ion battery cells) power an electric engine that drives the car. Hybrid engines use both a gasoline engine and a battery operated one that alternates between each other depending on the most optimal choice. There are also pure electric vehicles but are limited in terms of range and use. These type of vehicles have come into focus because of the movement to reduce the global carbon footprint. Carbon footprint can be simplified as the greenhouse gas emissions in an area, by an event, product, or person(s). The largest source of emissions come from driving fossil fueled vehicles (gasoline use). Reducing the carbon footprint from driving can be done primarily by driving less, or at the moment, developing more environment-friendly cars. Aside from engine and power plant, there are also other ways for vehicles to go green. Taking alternative transportation (public transportation, bicycles, walking) when the distance is not too far, scheduling trips during lean traffic hours, Using more environment-friendly products can also benefit the green movement and reduce greenhouse gas emissions. Most environmentally conscious drivers live with repressed guilt. It's clear that gas-guzzling vehicles are damaging the environment, but most of us depend on cars in everyday life and can't afford a new hybrid or EV. Eco-friendly living isn't all or nothing, however. Small adjustments can add up to equal a reduced carbon footprint. From how you shop for new tires to how you wash your car, advancements in green car products can help you offset that tank of gas. Tires are a visual reminder of how many miles you spend on the road. The more time you spend on the road, the faster the tread wears down. After enough commutes, road trips and sudden stops, it's time for new tires. Luckily, the burgeoning eco-friendly tire industry enables you to shop green when your tread is low. Green tires employ specially designed tread patterns that reduce resistance to the road. One example is the Kumho ECO Solus KL21. The tread pattern on these Kumho tires cut rubber dust emissions by 10 percent, prolonging the life or your tires and improving gas mileage. You may pay a little more for eco-friendly tires, but you'll save in the long run while reducing your carbon output. Few terms sound less eco-friendly than "oil." This crude commodity from the ground has done significant damage to our environment, so how could motor oil be an agent for eco-friendly change? Green Earth Technologies has the answer with its biodegradable motor oil. This full synthetic oil is certified by the American Petroleum Institute and has a high degree of biodegradability. These products used plant-derived base oils that produce less sludge and more wear protection. Once it's time to change your oil, this largely biodegradable substance won't take as a great a toll on the environment. The media usually highlights climate change when it talks about the environment, but water shortages are a much more immediate problem. Drivers who take care of their vehicles add to this problem by using gallons of water to wash their vehicles every few weeks. Eco-friendly company Freedom has given drivers a way to take care of their cars without wasting so much water. Freedom Auto Wash is designed to lift and dissolve dirt on contact. Simply spray a generous amount of this biodegradable liquid, and wipe down your vehicle. You'll have a clean finish without using a single drop of water. Even the smallest parts of your car promote a green lifestyle. Recyclable windshield wipers may not curb global warning, but they will reduce the amount of material you send to landfills. Tripledge Green blades are made from silicone instead of rubber. They require no oil to produce and can be reused when they no longer clean your windshield. Eco cars are fast becoming a popular choice. As of July 2013, the Toyota Prius have sold more than 3.4 million units. People are now seeing the economic and ecological benefits of using green cars. With the addition of other car related products going green, global carbon footprint may one day drop to acceptable levels. Ricky grew up in the U.K., but he loves working on and writing about American cars.